"Blindsighted" has everything I enjoy in an excellent Mystery / Whodunit I loved it and couldn't put it down. It took me about 3 days to read all 380 pages of it and I loved every page. Sara Linton is a great character. She's a strong woman that is portrayed as someone you would enjoy being friends with if you didn't already know someone just like her, which is a better possibility. The story takes you through major twists and turns, thrills and spills. It grabs you by the hand and doesn't let up until the final word. In other words, my kind of story. 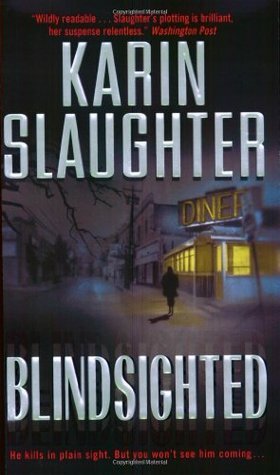 I can't honestly say there is a single book I've read by Karin Slaughter that I thought was mediocre, let alone awful. Slaughter is also unafraid to address some extremely taboo situations in this book that are unvarnished and "in your face" however, she does this with her usual good taste and class if those two words can even be used when you find out exactly what situations I'm talking about. When you read the book you will know exactly what I mean. Ms. Slaughter has never shied away from topics that are extreme but she has a way of writing about them in a manner that isn't tasteless or more disgusting than the actual event itself. I've been a long-time fan of her Will Trent series and had to learn the back story of Sara Linton who is also featured in the series. One of the first books I've read was the Grant County #2 for some reason I read it before this one which is the first. If you know me, you know I hate reading series out of order or skipping any of them. So I had to go back and read this one which I'm glad I did. In my opinion, you should read all of Karin Slaughter's books and in order, even though it isn't really necessary because she has a way of catching the reader up with what needs to be known to move forward without spending too much time on this process, or giving away too much of the story. I strongly recommend this book to all my friends the same as I do with all the books from Karin Slaughter that I've read so far. Thank you for another excellent read, Ms. Slaughter! Sign into Goodreads to see if any of your friends have read Blindsighted. 36.84% "A great book so far, I had to read all of these pages in the first sitting. As always Ms. Slaughter is delivering another great, hard to put down, book."